Stay close to Dollywood, Gatlinburg, the Great Smoky Mountains National Park when you reserve "Pool N Around" in the Smoky Mountains of Tennessee! 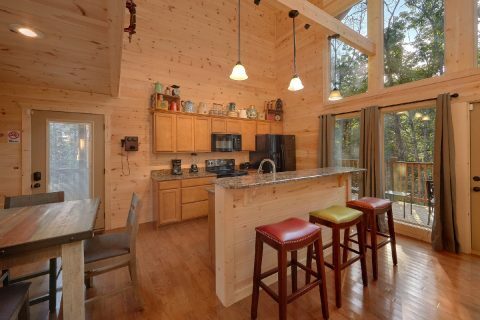 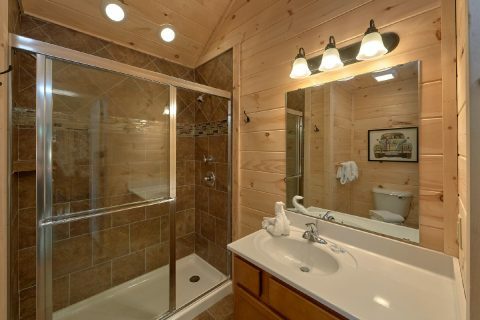 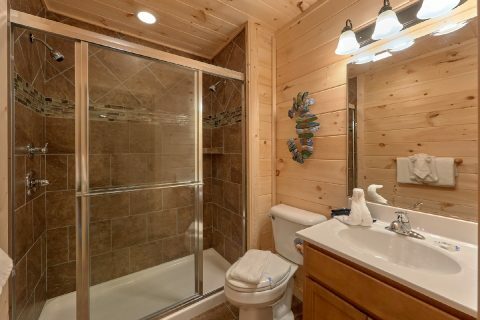 Your two bedroom cabin comes complete with luxury features, a peaceful location, and a great spot for enjoying a memorable stay in the mountains near Dollywood. 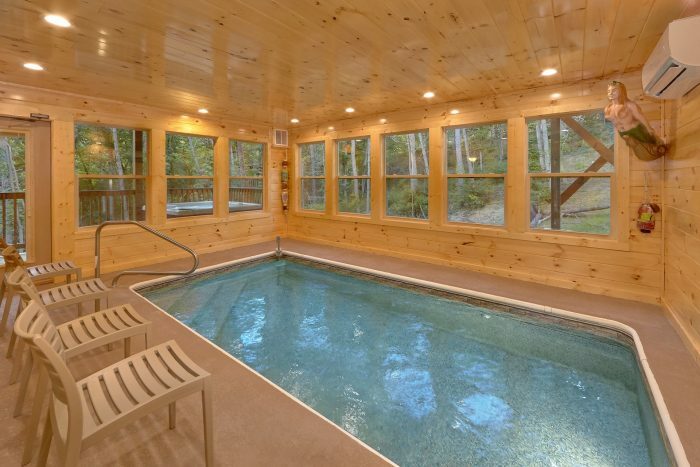 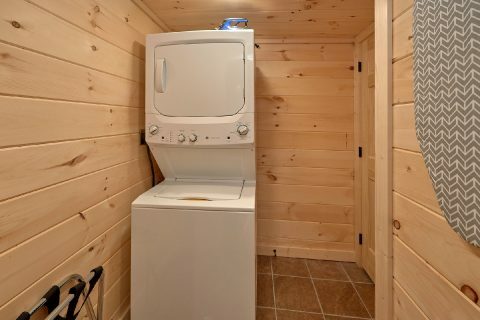 If you'd like to spare no expense on your Smoky Mountain vacation and earn terrific savings, simply book this luxury cabin near Dollywood with an indoor swimming pool that comes with a 15% discount! 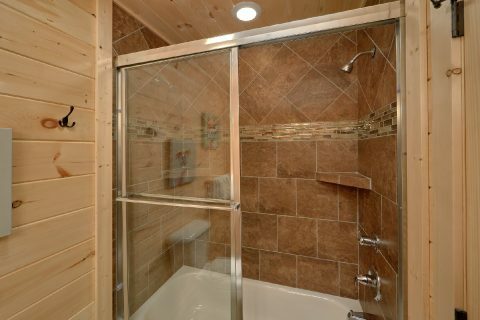 Enjoy a premium cabin experience where you can swim in privacy without paying a luxury cabin price! 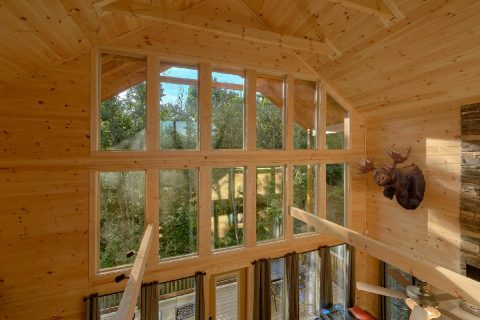 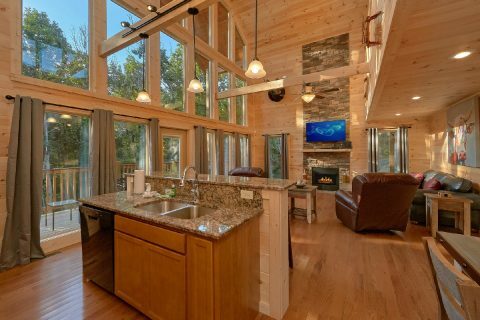 When you awake in your premium two bedroom cabin, you'll experience the beauty of morning in the Smoky Mountains thanks to large windows that allow natural light to pour in. 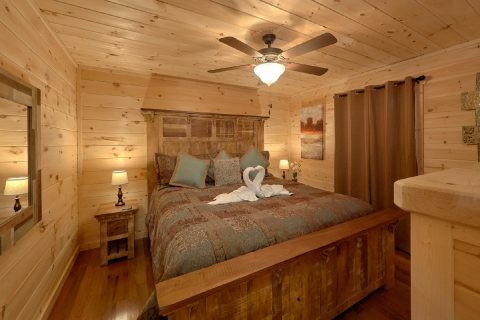 You'll find a king-size bedroom on the main level and a king-size bed in the lower level of your cabin rental. 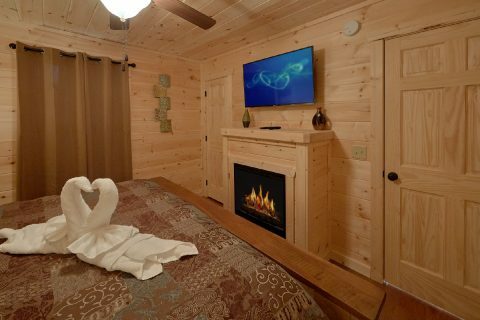 Both of these rooms come complete with televisions and romantic electric fireplaces. 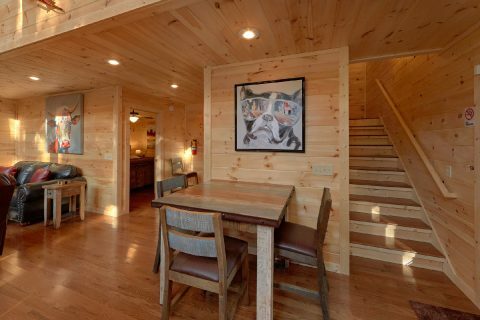 For additional sleeping space, the living room comes complete with a sleeper sofa. 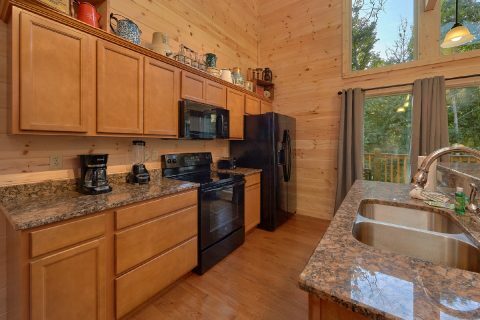 From your cabin's deck, you can appreciate the sights and sounds of nature while you dine on a breakfast made in your rental's fully equipped kitchen. 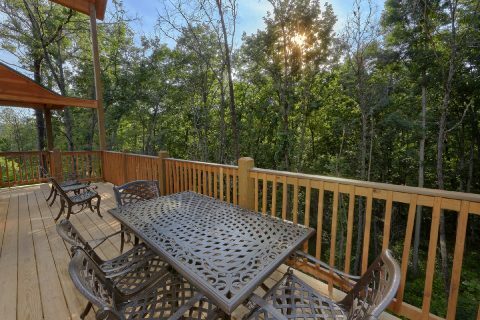 Will you plan a hike in the Great Smoky Mountains National Park? 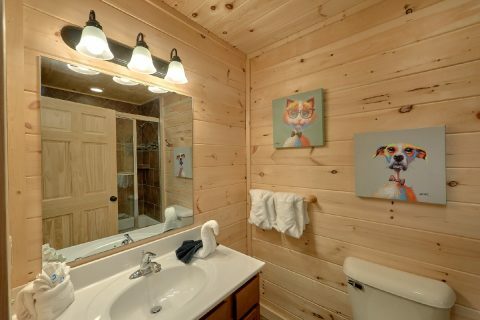 Or visit Ripley's Aquarium of the Smokies in Gatlinburg? 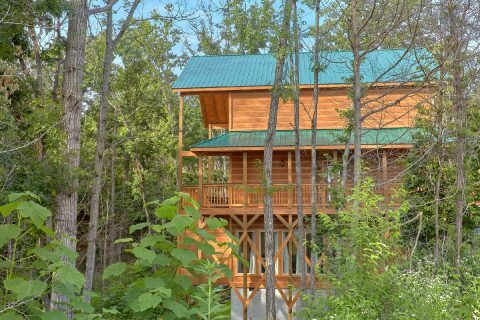 Or spend a day at the world-famous Dollywood Theme Park to ride fun roller coasters, see Smoky Mountain music shows, and experience one of the most hospitable and family-friendly amusement parks in the nation? 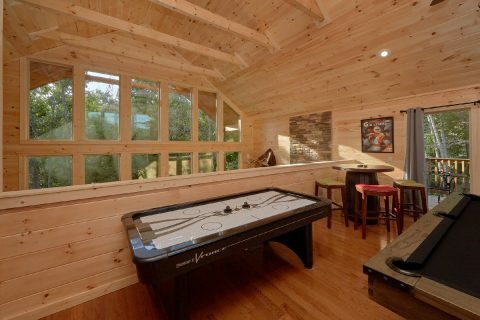 All in all, you'll have plenty of great options that are perfect for making excellent memories with friends and family. 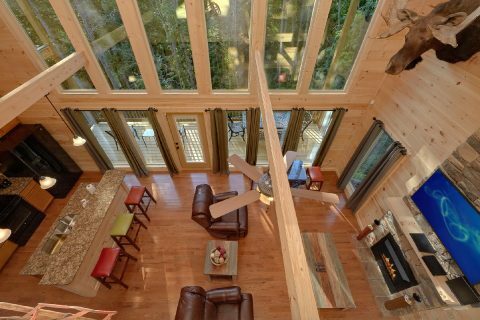 When you return to your luxurious Smoky Mountain cabin retreat, you can look forward to relaxing just the way you like. 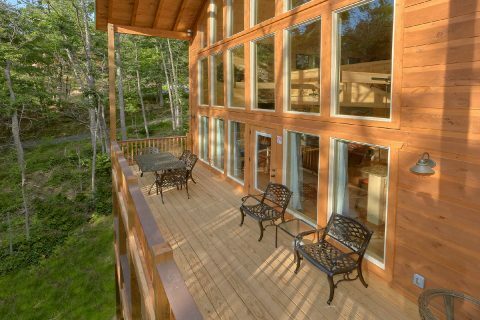 Whether you want to take a dip in the hot tub or sit back your rental's deck to enjoy the view, you can unwind just the way you like. 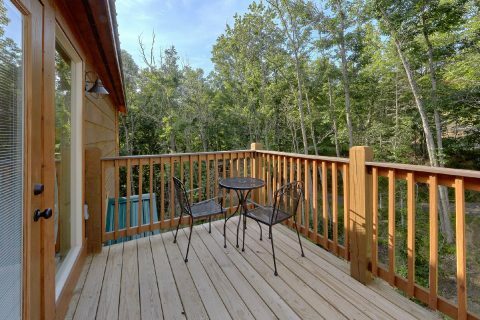 In the summer, enjoy a cookout in the great outdoors with your rental's grill. 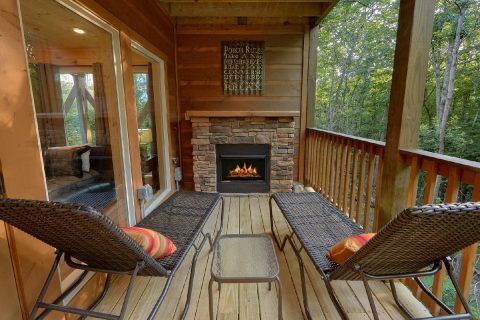 In winter, stay toasty by the gas fireplace and drink some hot cocoa. 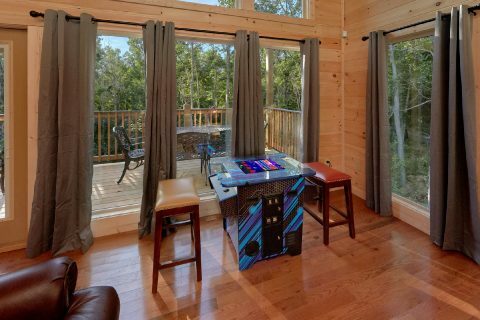 Additionally, this cabin's upper floor game room loft comes complete with an air hockey game, an 8-foot pool table, a 64 game arcade, and a 12-ft shuffleboard, so there are plenty of ways to enjoy some friendly competition during your stay. 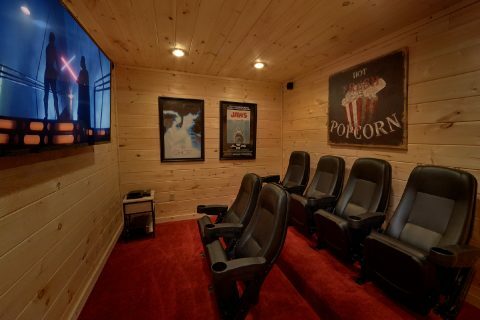 Downstairs, there's even a theater room so you can enjoy an excellent movie night during your vacation. 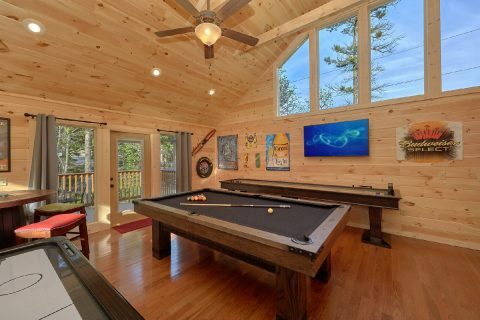 At the day's end, you'll know you're making the most of your cabin vacation by choosing the comfort, luxury, great location, and fantastic amenities offered by "Pool N Around"! 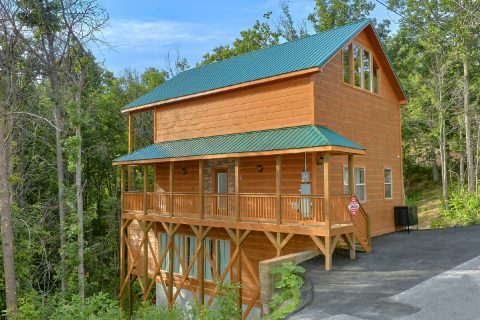 If you need more room for your group, consider booking several nearby cabins through Cabins USA Gatlinburg! 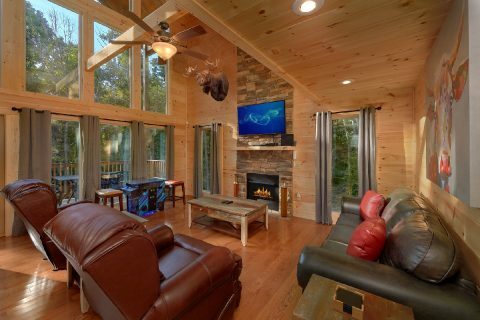 Book today and save 15% with our cabin discount!